Couso, Javier, Alexandra Huneeus, and rachel Sieder, eds. 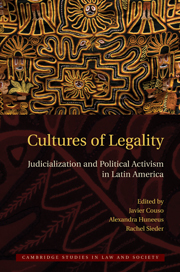 Cultures of Legality: Judicialization and Political Activism in Latin America. Cambridge UP, 2010.